Professional Development has never been easier these days. I undergo professional development every day with my Personal Learning Network (PLN), which I like to call my Professional Learning Network. The best thing about my professional development is that I can participate on my time ... any time ... for free! So, if professional development is so easy, why isn't every teacher pursuing their own professional development everyday? Well, its because creating a Personal Learning Network can be intimidating. Teachers often don't know how to get started, lack the confidence to get started, or feel like they don't have enough time to get started. 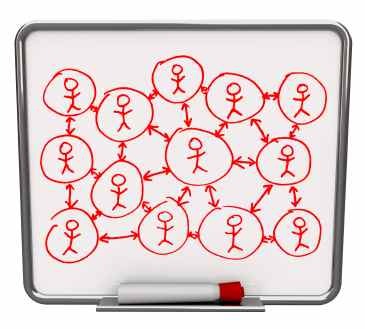 In this guide, I will solve those problems by explaining how to easily create a Personal Learning Network from scratch and how to enhance existing PLNs. Below is a screencast that I created to show how I engage in my Professional Learning Community from my PLN that I have established. Google Reader is a great way to start your Professional Learning Network. The concept of Google Reader is brilliant. Instead of you going to all of your favorite websites for news, information and blogs, Google Reader brings all of these websites to you! I personally use Google Reader to stay current on topics such as education, technology, current events, science, health and fitness. With Google Reader you can subscribe to free news resources, periodicals, blogs, etc. and organize them to your liking. I find it much easier to have the news come to me than for me to go to the news. Getting Started: If you already have a Google Account, you are one step ahead. If you don't have a Google Account, go ahead and create one at mail.google.com/. After you have created your Google Account, visit the website: www.google.com/reader to get started with your Google Reader. Here you will be able to subscribe to periodicals, blogs, etc. Getting Started: Twitter is another great way to develop your own PLN. It's easy to create a Twitter Account. Just go to Twitter.com to create your account. Create a personal username that you will use as your Twitter Name. For example, my Twitter Name is @MrLands. After you have created your Twitter Account, you can start following people. After you have successfully created a Google Reader account and a Twitter Account, you have successfully created the frame for your PLN. Twitter and Google Reader actually work hand-in-hand together very nicely. You can browse Twitter to find people that you want to follow and add their personal websites or blogs into your Google Reader Account. Managing Subscriptions: If you have a favorite periodical such as Education News - The New York Times, chances are Google Reader has a web presence that you can follow for free. Just conduct a Google Reader Search for the blog or periodical that you would like to subscribe to and it will give you a list of possible results. Find the one that you would to subscribe to and click the subscribe button. Google Reader will then automatically add that free subscription to your Account. Creating Bundles: To organize all of your subscriptions, you can create a folder, or a bundle of subscriptions. You can label the folder or bundle however you want to help you organize your subscriptions. For example, I have bundles such as Education, Technology, etc. You can also share your bundles that you create with other people, which is a really cool feature of Google Reader. The Star Feature: In Google Reader, you can easily scroll through the headlines of your subscriptions to bypass any articles or blogs that do not interest you. In addition, you can create a list of your favorite articles by starring them. Starring articles also allows you save it to read it later when you have more time. In short, star your favorite articles, or star the articles that you want to read later. Feedly: After you have successfully set up your Google Reader Account, I would recommend using Feedly to read your periodicals. Feedly is an application that turns your periodicals from Google Reader into an easy to read e-Magazine. I use Feedly to read my subscriptions on my computer, on my smartphone and on my Kindle Fire. 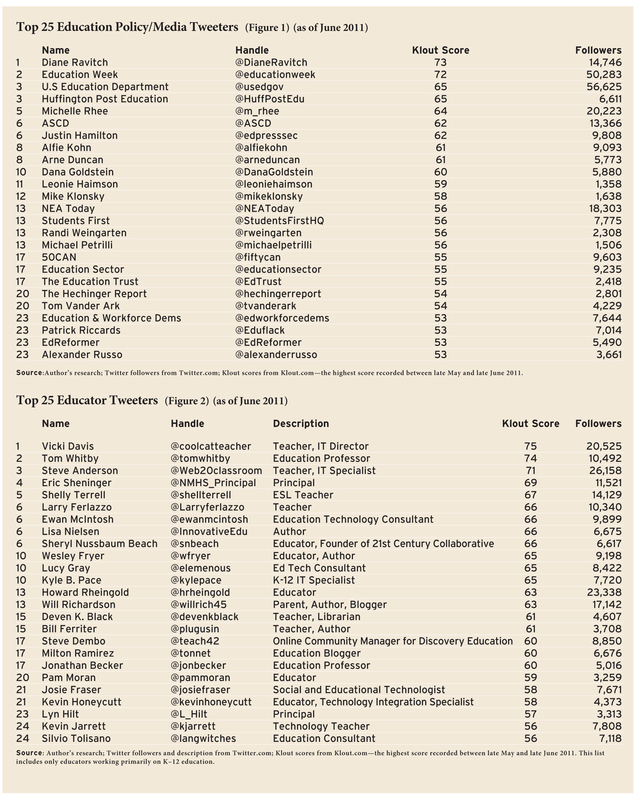 Who to Follow: If you want some advice on who to follow, start by following some of these valuable educators in the lists below. The first list is the Top 25 Education Policy/Media Tweeters and the second list is the Top 25 Educator Tweeters. I personally follow at least 10 in each of these lists. My suggestion is to figure out which ones are most valuable to you! By following these people, you will be able to read what they are sharing with the world of educators, such as resources, lesson plans, pedagogy, etc. When searching for these people, type the "handle" name in your search. After you perform a search, click the "follow" button to follow that person. You can also search for famous educators or celebrities as well. Type in their first and last name into the search box to get your results. For example, I follow both Adam Savage and Jamie Hyneman from Mythbusters and I found them by performing a Twitter Search. Twitter Hashtags: In addition to just following people on Twitter , you can also follow topics and conversations. In order to do this, you can type in a search for specific Twitter Hashtags. A hashtag is the "#" symbol attached to a specific set of characters. For example, a Twitter Hashtag could be something meaningful like #science, or it could be arbitrary such as #k4g8bz74. Twitter Hashtags are used to follow specific conversations and topics. Anyone can create a Twitter Hashtag and anyone can follow a Twitter Hashtag. Twitter Hashtags are used a lot during conferences and workshops, so be sure to look for them at your next professional development event. Some of my favorite Twitter Hashtags to follow and contribute to are #edchat and #edtech. Twitter Alive shows you lots of different educational Hashtags that are all live. This means that you can view several different Twitter conversations at once. Every time you visit the website, the conversations are live and current up to the minute. Feel free to look at the other educational Twitter Hashtags off to the right to view other conversations. The A-Z Dictionary of Educational Twitter Hashtags is the best list of educational Twitter Hashtags. You can find just about any topic or conversation on this list. If you find a few that you like, perform a search on Twitter using the Hashtags and start reading the conversations. Twitter Chat Schedule is a Google Spreadsheet that tells you the times and dates of scheduled Twitter Hashtag Conversations. This can allow you to view a conversation at a specific time when lots of people with be contributing. If you have something to add, feel free to send your message to contribute to the conversation! 28 Creative Ideas for Teaching with Twitter is a great list of ways to incorporate Twitter into your instruction. I personally use some of these strategies in my classroom and they can be very educational and productive to my students. Create a Blogger Account and Start Blogging! When you are ready to contribute to your PLN by sharing your own opinions, resources, information, etc. I would use Blogger (powered by Google). Since you already have a Google Account, Blogger imports information already in your Google Account, which makes it very easy to get started. It also runs on the same platform, so it will be easier for you to navigate throughout the website. To create your own blog go to www.blogger.com/ and follow the directions. After you have created your own blog, you now have a voice to contribute to your PLN and share with the world. Lastly, I use Twitter as a vehicle to share my blog posts that I create. I tweet the title of my blog post along with a short description, the shortened website link, and a hashtag or two. This allows me to contribute to my PLN and share my two cents with the rest of the world! Check out Twitter Etiquette: 24 Guidelines to Tweet By to become a better Tweeter! I hope that this guide was helpful to you. Best of luck with creating and maintaining your own PLN.